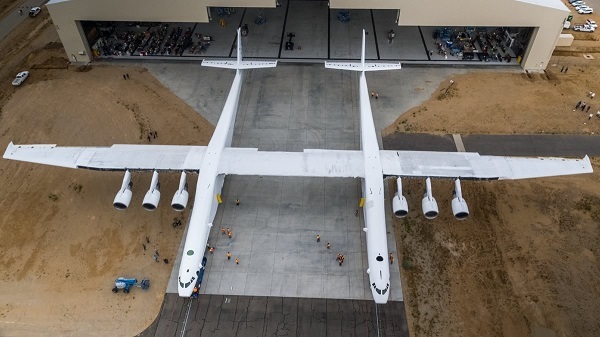 Checking my messages on Wednesday at LAX after a long flight from back east, I was startled to learn that Paul Allen’s ginormous Stratolaunch aircraft had been rolled out of its hangar for the first time in Mojave while I was in transit. I had been expecting some official roll-out ceremony later this year ala SpaceShipTwo where the press and public could get a good look at the twin fuselage, WhiteKnightTwo-on-steroids air-launch platform. But, for better or worse, Paul Allen is not Richard Branson, and Scaled Composites — which built the aircraft — is most assuredly not Virgin Galactic. So, the press would have to settle for a quiet roll out and some photos and videos provided by the company. What they show is stunning enough. At 238 feet long, 50 feet high and spanning 385 feet from wing tip to wing tip, the Stratolaunch carrier plane is an absolute monster that makes everything around it — people, vehicles, ground equipment — l0ok tiny by comparison. It’s going to be spectacular — and undoubtedly nerve wracking — sight when that beast roars down Runway 30 powered by six Boeing 747 engines and lifts off into the Mojave sky for the first time. But, amid all the oohs and ahhs and congratulations, it’s hard to ignore some of the dark clouds that have gathered over the program in the 5.5 years since Allen and Burt Rutan — the team behind the wildly successful SpaceShipOne — unveiled Stratolaunch to the world back in December 2011. More specifically, its niche in an increasingly crowded launch marketplace is unclear. For a project that’s consuming hundreds of millions of dollars, that’s not good. Not good at all. To understand the problem, it’s necessary to look at the long, winding road between the initial announcement and the roll out on Wednesday. That road contained a number of what are called pivots in Silicon Valley. The original plan was for the giant aircraft to launch a medium-lift booster. The ability to place a largish satellite into any orbit would be attractive to a number of commercial and government customers, the argument went. It was a unique service no one else was offering in that payload class. But there were doubters. Some argued the rocket didn’t make sense commercially; its payload capabilities were not unique enough. There had to be more to it than what Rutan and Allen were saying. Speculation in Mojave focused on the U.S. military as a primary customer for the “any orbit, any time” service Stratolaunch could provide. There was even speculation the military might be a secret backer of the project through one of its black programs. The term “Glomar Explorer” — the name of the Howard Hughes ship nominally built to mine manganese nodules from the sea floor that secretly recovered a sunken Soviet nuclear submarine for the CIA — was frequently bandied about. Not everyone bought that argument, but there was some logic to it. Rutan stressed the civilian uses for the booster, talking about sending up payloads created at home by unskilled workers (i.e., people) into orbit. A study was conducted that examined the feasibility of launching a scaled-down version of Sierra Nevada’s Dream Chaser shuttle. This is an artist’s conception of Sierra Nevada’s flight test vehicle and a Virgin Galactic White Knight 2 carrier aircraft during a captive carry test. Image credit: Sierra Nevada Corp.
Whatever the actual market for Stratolaunch, a massive hangar and a manufacturing building were constructed at the end of Ricommini Street a short distance from the end of Runway 30. A small army of workers began building the world’s largest airplane. But, a funny thing happened on the way to orbit. They found they couldn’t actually get there. At least not the way they planned to. And so the pivoting began. 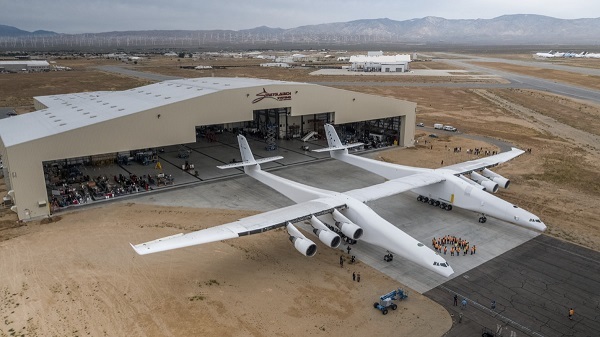 From Voyager to the Virgin Atlantic GlobalFlyer to SpaceShipOne and SpaceShipTwo and now Stratolaunch, Rutan and Scaled Composites have demonstrated the ability to design innovative and funky-looking flying machines. However, there is one area where their record is rather more mixed: rockets. 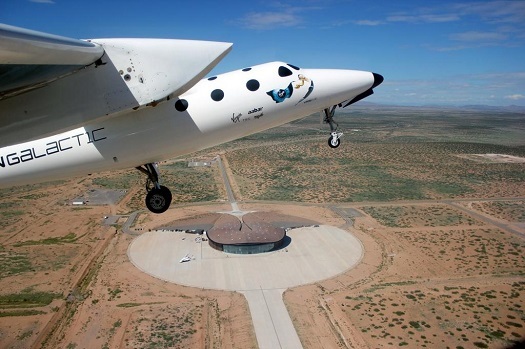 The hybrid engine they used on SpaceShipOne was sufficient to get the ship above the Karman line at 100 km. 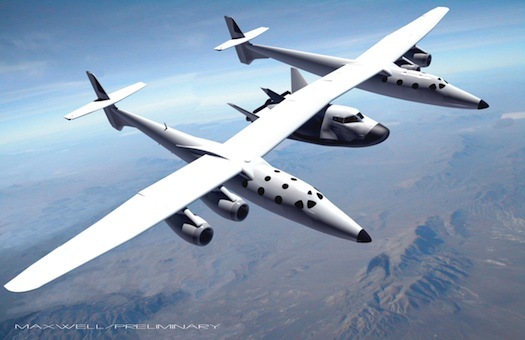 When it came time for the sequel, Rutan’s company designed and built the much larger SpaceShipTwo and WhiteKnightTwo mother ship assuming it would be a relatively easy matter to scale up the rocket engine. That turned out to be a catastrophic miscalculation. Three Scaled employees were killed in a cold-flow test of a new valve because Rutan and his team didn’t understand the volatile nature of the nitrous oxide they were using. Engineers struggled for a decade to develop an engine that wouldn’t shake SpaceShipTwo and its occupants to pieces with vibrations and oscillations. That problem has been solved. But, today it’s not clear whether Virgin Galactic has a hybrid engine powerful enough to get the vehicle, two pilots and six passengers above the Karman line. Despite nearly 13 years of effort, the new ship might not be able to fly as high as its predecessor. 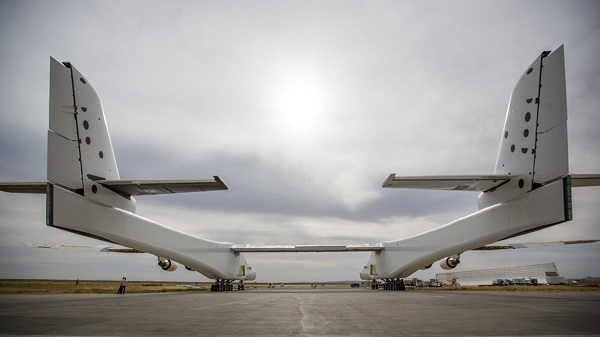 Scaled’s efforts to develop a booster for Stratolaunch also went south. The reasons are different, but the end result is eerily similar: engineers have built an elegant and innovative flying machine paired with an under-powered rocket. It was not for lack of trying. A source with knowledge of the program has told Parabolic Arc that booster development contracts were given to three companies in succession. None of the agreements produced the medium-lift booster Stratolaunch wanted. The source said the contract was originally given to a Huntsville company called Dynetics.But, that didn’t work out very well and the agreement was terminated. Stratolaunch next signed a contract with Elon Musk’s SpaceX to build a variant of the Falcon 9 booster. That plan ended after about a year. SpaceX officials said the booster didn’t fit into the company’s long-range development plans. Another source said SpaceX hadn’t made much progress on the booster. Orbital Sciences (now Orbital ATK) was then brought in to produce a booster. But, that partnership lasted about 16 months before Stratolaunch suspended it in 2014 after concluding Orbital wasn’t a good fit. So began a years-long search for something to launch from the massive aircraft being constructed in Mojave. Stratolaunch officials said they hope to launch a range of boosters, including ones serving the booming small-satellite market. They apparently talked to anyone and everyone with a rocket or an engine or a plan for one. When Stratolaunch officials finally announced the rocket they would use last October, the answer startled a lot of people. They would launch the Pegasus XL small-satellite booster built by Orbital ATK. The selection was a real head scratcher for multiple reasons. First, Pegasus XL is the world’s smallest operational satellite booster. To launch it from the world’s largest carrier aircraft seemed rather strange. It would certainly look odd when they actually launch it. Second, Pegasus already has a carrier aircraft. Orbital ATK’s Stargazer L-1011 is parked just down the Mojave flight line from the hanger that houses Stratolaunch. Orbital ATK also said it will continue to launch Pegasus XL boosters using Stargazer. That fact raised the question of where exactly Stratolaunch is positioning itself in the marketplace. Building a monstrous, one-of-a-kind aircraft to fly a booster that can be launched from a modified, second-hand passenger jet doesn’t make a lot of sense. An artist’s conception last year showed Stratolaunch in flight with three Pegasus XL boosters. This would give the aircraft a unique capacity to launch multiple rockets on the same flight, something Orbital ATK’s Stargazer cannot do. The problem is that there just isn’t that much demand for the Pegasus. The rocket has only flown 43 times since it debuted in 1990. Years have gone by between launches. In between, Stargazer sits baking in the Mojave sun doing nothing, going nowhere and racking up maintenance and rent costs for its owner. The current lack of demand means few boosters are built which, in turn, makes each one of them expensive. 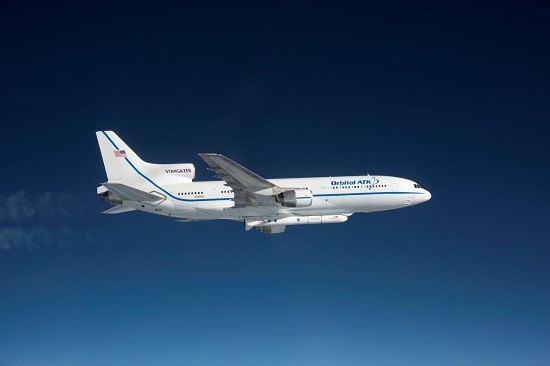 NASA — which is one of the booster’s few users — is paying Orbital ATK approximately $56.3 million to launch the agency’s Ionospheric Connection Explorer (ICON) satellite in November. That cost is almost as high as the $62 million list price for SpaceX’s Falcon 9 rocket. In fairness, actual launch costs are often higher due to related services SpaceX provides and special requirements for government launches. But, what will happen when SpaceX begins significantly dropping the cost for Falcon 9’s that reuse their first stages. Now, could Stratolaunch actually fly with three Pegasus XL’s at once? Would the increased production lower the cost of each individual rocket low enough to increase demand to the point where it made economic sense? Those are hard questions to answer. In any event, Pegasus is also under commercial threat from dozens of new boosters being developed around the world. Most of these programs do not target payloads of that same weight class, and the majority of the companies will likely fail to produce anything. Even so, competition from startups could further shrink the demand for Pegasus XL. As currently configured, Stratolaunch lacks an unique and clearly defined role in a burgeoning launch services industry. The aircraft seems to be a one-of-a-kind solution in search of a problem to solve. That sounds good. But, it’s also what they’ve been saying for three years now, with only Pegasus XL to show for it. Perhaps there are things in the works that will make building such a large aircraft worth it. However, if things don’t change, Rutan’s giant could end up joining Spruce Goose as an expensive museum piece. Providing they can find a building large enough to hold it. Your ignorance seems so blissful. I wish I could share it. Launching multiple airborne rockets at once makes great sense since the only competitive advantage of an airborne launch is to launch a specific payload at the right time into the right trajectory. Adding another couple of secondary cargoes, on separate Pegasus launchers, which are the most expensive per kilogram to orbit of all launchers in the world, on the same aircraft run, that doesn’t look fundamentally sound to me. Isn’t the take off of this giant aircraft relatively cheap, so that it could do it specifically for each payload? Isn’t that the whole business idea? Good Discussion on this. It just occurred to me that it might be interesting if this capability met the new low-cost electron rocket from rocketlab (US/NZ). That vehicle is largely 3D print and 100% discarded. If you dropped it and ignited from 35kft, you would undoubtedly increase the orbit altitude you can deliver to, as well as “any” inclination (not just NZ latitude). There are surely numerous issues trying to fly a cryo rocket (LO2/RP1) from an aircraft, but at only $5M per copy – 1/10th the cost of a pegasus – you can fix a lot of problems before you cost as much.